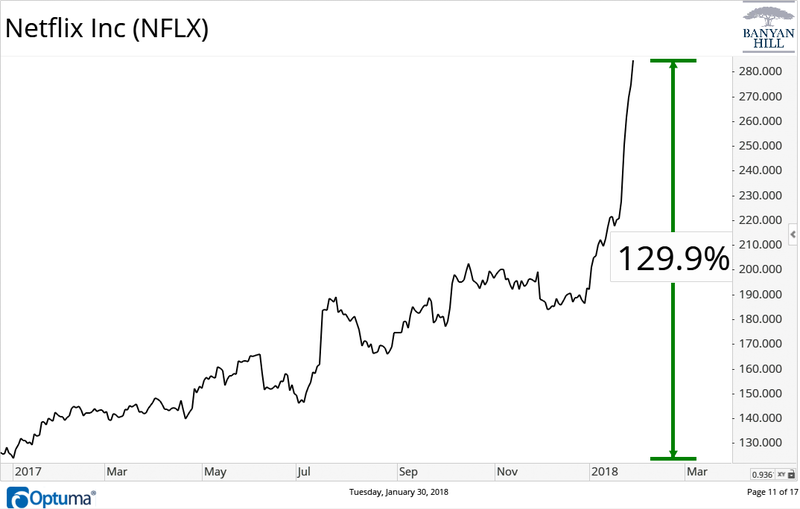 Shares of Netflix Inc. (Nasdaq: NFLX) were on absolute fire over the past year, soaring 129%. The latest fuel for Netflix’s rally was an earnings report that sent shares up more than 8%. But the company only met earnings expectations. The reason for the surge in its stock price was only because the company had added more subscribers than expected. But the company is also spending a ton of money on its own content to add those new subscribers — and the reason why may also be what kills Netflix’s rally. Take a look at the surge in the stock since the start of 2017. I think Netflix developing its own content will be necessary for the company to stay competitive in a world that is finally catching up to its online streaming model. But I think this also means the run for Netflix stock is about over, and you don’t want to be stuck buying shares at the high prices today. That’s because the main reason Netflix is investing more and more on content is because one of its major providers of content is pulling back its content and releasing a Netflix competitor. And that company is Walt Disney Co. (NYSE: DIS). You could throw just about any other media company in that spot to try and compete with Netflix, and I wouldn’t think much of it. But when you throw in Disney’s media assets, you will understand why Netflix is spending rapidly. Disney is one of the top content distributors that exists. Its channel lineup attracts audiences of all ages, and its library of content is likely the largest that exists. That’s because we are not just talking about its Disney Channel shows, which target kids. The company owns ABC, ESPN, A&E, History Channel and more. The company has also acquired other big names in the movie space over the years, like Pixar (the company that made Toy Story), Lucasfilm (the Star Wars franchise) and Marvel Entertainment (home to hit titles like Spider-Man, Captain America and Iron Man). All told, Disney owns one of the most robust content lineups that exists, and Netflix’s attempt to create its own platform of content is a tiny step toward the direction of a giant like Disney. Disney has said it plans to release a streaming service to compete with Netflix, although that probably won’t arrive until 2019 or so — giving Netflix some time to prepare. But the clock has started, and Netflix’s heavy spending is just beginning.